In response to a letter from the Rabbinical Congress for Peace (RCP), which comprises over 350 prominent Israeli rabbis, Knesset speaker Yuli Edelstein (Likud) affirmed that peace negotiations with no backing from the other side is a dangerous thing. “There is no doubt in my mind that empty words like ‘negotiations’ or ‘peace agreement’ that have no backing other than preparedness by Israel to concede without getting anything in return is futile,” wrote Edelstein. The last coalition government embarked on nine months of peace talks that were torpedoed by the Palestinian Authority (PA) in April, and in the process released 78 terrorists, many of them in jail for murder, as a “gesture.” The government also instituted a freeze on Jewish construction in Judea, Samaria and eastern Jerusalem that has continued, even after the collapse of the talks. 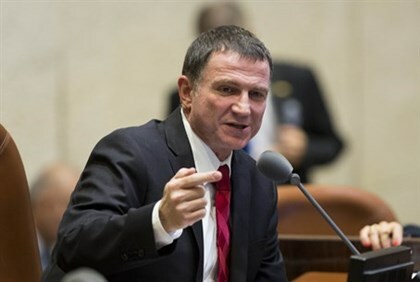 Edelstein wrote in response to RCP’s campaign calling on the government to officially condemn the policy of land withdrawals as a “fatal mistake,” citing the blatant example of Gaza where Hamas took control thanks to the 2005 Disengagement plan. Commenting on Edelstein’s response, RCP Chairman Rabbi Yosef Gerlitzky said Edelstein in essence acknowledged the precept of Jewish law stated in the formative legal text Shulchan Aruch (Orach Chaim, 329), stating that surrendering land increases danger to human life and advising Israel to adopt this Jewish law as the state’s guideline for peace and security. In addition to stating regret for past agreements and withdrawals, Rabbi Gerlitzky called on the government to officially state it will refrain from negotiations suggesting future withdrawals. “When dealing with Jewish Law there is no left or right,” said RCP Director Rabbi Abraham S. Lewin. Gush Shalom: the real criminal is the occupation, not Azariya Left- wing Gush Shalom movement says those who sent Azariya to Hevron to perpetuate 'cancerous armed enclave' should sit on accused bench.